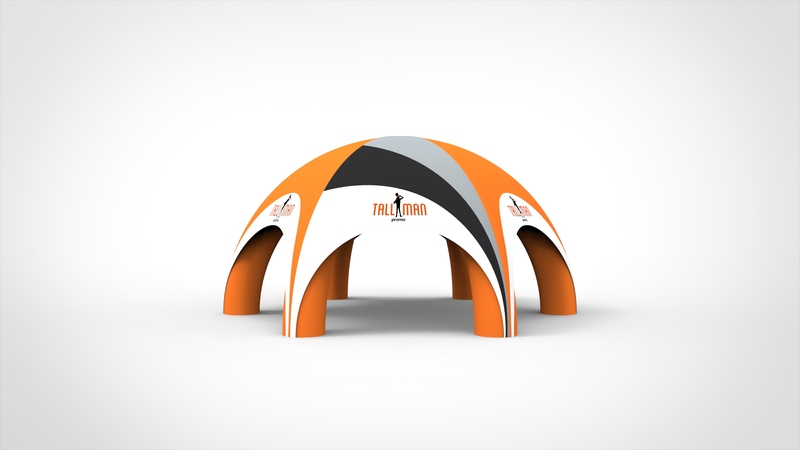 TALLMAN.PROMO 4-leg Protego inflatable continuous air domes are a unique, eye-catching twist on the traditional instant canopy. Protego domes are sturdy and heavy, so your inflatable stays in one place indoors or outdoors. These inflatable domes require continuous air supply (the Canadian Certified Blower is included in the price). Electricity is required, removing worry about leaks in the tent at your event. Simply plug in the air blower, attach it to the inflatable and it is ready to go in minutes. It is important to us that your dome has effective branding. Display your logo and design in eye-catching ways! Protego Domes are great for trade shows, community celebrations or special events – anywhere you are trying to grab attention. Complete branding of your continuous air dome will get you noticed and remembered. The domes are packaged in one easy-to-handle carrying case, convenient for storage. The inflatable frame is made from a printable polyester for complete cover of artwork and custom colours. The dome is printed on polyester and the frame is made of sturdy PVC. Templates are available upon request. Inflatable domes are fully customizable and have the option for adding additional walls.